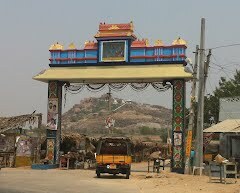 Cheruvugattu is a Village in Narketpally Mandal in Nalgonda District, Andhra Pradesh. . .
Cheruvugattu is 16.3 km distance from its District Main City Nalgonda . And 80 km distance from its State Main City Hyderabad . Chants of “Hara hara mahadeva” and “om namaha shivaya” reverberated at all the Shiva temples in various parts of Nalgonda district. At the Cherugattu temple temple, devotees have formed serpentine queues to offer prayers to the presiding deity Lord Siva. They performed special poojas. Sri Parvati Jadala Ramalingeshwara Swamy kalyanam was performed with religious fervour and divine grandeur at the famous Cheruvugattu hill shrine in Narketpally .Braving intense cold wave conditions, scores of devotees thronged the hill shrine and took a holy dip in the koneru adjacent to the temple in the wee hours. The devotees watched the celestial wedding with utmost devotion. The temple reverberated with Vedic chantings during the kalyanam. Later, the devotees performed sacred rituals and worshiped the temple deities. Agnigundalu, one of the main events of the ongoing Brahmotsavalu, will be held at the hill shrine on Sunday night. Dopotsavam, Mahapurnahuthi, Jyothirlingarchana and other sacred events will also be organised. The temple deities will be taken in a ceremonial procession on Gajavahanam in the evening on January 27 marking the conclusion of the Brahmotsavalu. The district administration had made elaborate arrangements for the pilgrims visiting the temples from far-flung places. The district police machinery had geared up to face any eventuality during the jatara by deploying heavy police forces at the temple shrine.